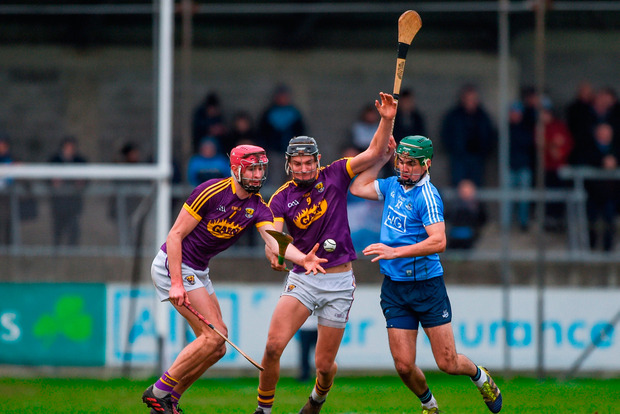 DAVY Fitzgerald and Brian Cody will face off early this year, with Wexford qualifying for next Sunday’s Walsh Cup final by virtue of a 1-20 to 0-16 win over Dublin in Parnell Park. Dublin played the final 25 minutes of the game with 14 men after Paul Winters was sent off and as a direct result, failed to score between the St. Brigid’s man’s 46th minute dismissal and injury-time at the end of the game. Wexford started the more sprightly. Conor McDonald had two points on the board after four minutes but was starved of space thereafter. Dublin crowded their defence when necessary and despite the obvious weariness of their limbs, their effort was hugely impressive on a heavy Parnell Park pitch that cut up badly as the game went on. Paul Winters, who had an entertaining battle with Liam Ryan, hit six first half points, five frees, but missed to late on and Donal Burke was switched on to placed-ball duties for the remainder of the game. Starting his first competitive game since 2015, Danny Sutcliffe scored one peach of a first half point, too. But most of the marks awarded in that first half went for physical, rather than artistic, merit. Dublin led by 0-11 to 0-8 at half-time and the closest anyone came to a goal in that period was when Alan Moore raced through before being chopped unceremoniously from behind by Ryan. The most significant moment of the second came after 46 minutes. After becoming involved in a scuffle on the endline, Winters was sent off for a second yellow card. Dublin had scored three of the first four points of the half to go 0-15 to 0-10 up but with an extra man, Wexford destroyed them from then on. With a spare man at the back and seemingly able to find space in midfield at will, Wexford rattled off the next 1-9 without reply. Cathal Dunbar smashed their goal after being fed by Damien Reck after a sniping run from deep. Jack Guiney came on for Davy Fitzgerald’s team to score three excellent points while Pat Gilroy will reflect on a game when his team failed to score for the final 25 minutes of the match, until Fergal Whitely’s injury-time score.